4 Tbsp. Lemon Juice, divided into (2) 2 Tbsp. Preheat oven to 350 degrees. Lightly grease the donut pan with baking spray. In a large bowl, combine the butter, coconut sugar, eggs, and vanilla. Add 2 Tbsp. lemon juice, lemon zest, nonfat milk, and yogurt, and mix well. In another bowl, combine flour, baking soda, baking powder, salt, and Vanilla + Coconut Water Collagen Peptides. Add the dry ingredients to the wet ingredients and stir until well combined. Add 1 cup of blueberries. Carefully spoon the batter into the donut pan, filling each well about 2/3 full. Bake for 8-10 minutes or until the tops of the donuts are lightly golden. Allow to cool on a cooling rack. While the donuts are cooling, simmer 1 cup of blueberries and 2 Tbsp of lemon juice in a small saucepan over low heat. When the berries are soft, smash them with the back of a spoon, and then strain the mixture through a fine-mesh sieve to remove the skins. In a small bowl, whisk together powdered sugar and 1 scoop of Unflavored Collagen Peptides. Add the blueberry sauce and whisk until smooth. If necessary, add a splash of non-fat milk to thin the glaze. 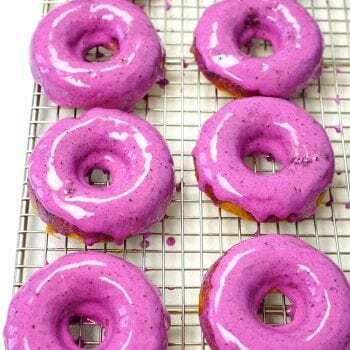 Dip the top of each cooled donut into the glaze and allow to set up for 30-40 minutes.